Since its introduction back in 1984, iMediaTouch has been setting trends in Radio with industry "firsts". 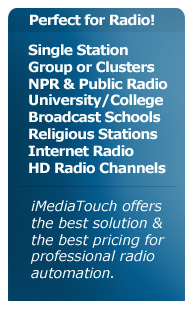 iMediaTouch continues this trend by encompassing the latest in broadcast automation software technology. So why do Broadcasters choose iMediaTouch? iMediaTouch is the most advanced automation system for any format, any single station operation, or any broadcast cluster. Sports Broadcast Affiliates can benefit from fully automated baseball, NASCAR® and even local remote sports broadcasts – all done in one daily log. "Optional On-Air Screen Audio Library" displays with Drag ‘N' Drop into the main log and hot key pages.